Exploring topics today that are changing the industry of tomorrow. Our dedicated ‘inspiration space’ is here to bring you the latest ideas, insights and innovations from across our global network. Melting, dosing, moulding, die casting, surface preparation and finishing technologies – all connected by sophisticated IoT digital solutions. Connect with us at GIFA in hall 11. 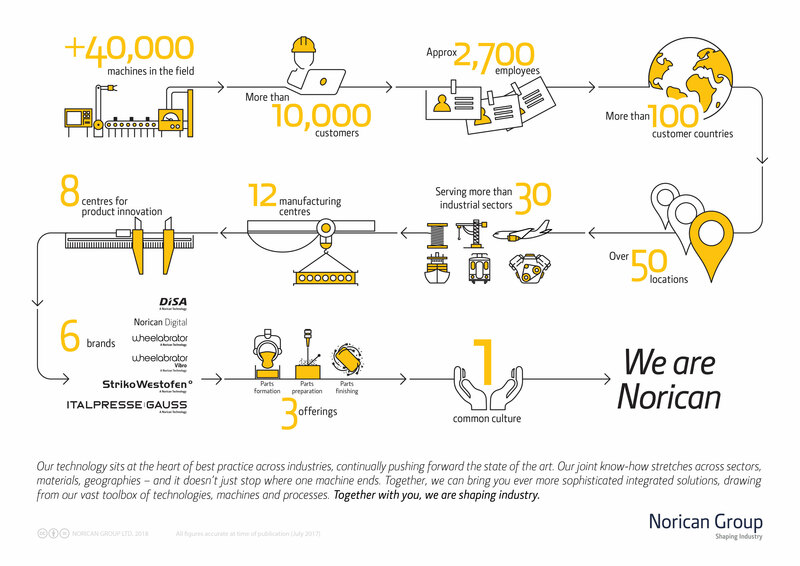 Norican Group is home to four leading, globally operating brands: DISA, Italpresse Gauss (incorporating Italpresse Industrie and Gauss Automazione), StrikoWestofen and Wheelabrator, with digitalisation solutions from Norican Digital. As one strong global partner, we are able to serve you better, faster and more efficiently, giving you easy access to all we have to offer and working in partnership to keep you well ahead of the curve. From melting, dosing and moulding through to surface preparation, we provide the solutions to solve your challenges. End-to-end green sand foundry equipment for the bright world of metals. Shot blasting, shot peening and surface preparation solutions. High pressure die casting machines, automatic work cells, integrated turnkey solutions and gravity die casting of aluminum and magnesium. High-end furnace technology for the global light metal casting industry. Increasing productivity in the metalworking industry with IoT technologies. Explore our New at Norican section and get the latest news, case studies and technology innovation articles.